No doubt the bilge pump is one of the handy tool for anyone who regularly or occasionally goes for adventure in the water by kayak, boat or canoe. The bilge pumps work like an excellent drainage system that can remove the water from bilge. This handy tool not only helps to keep the floor dry by removing the water, but also protect your boat from sinking in the water if the floor gets leaked or cracked. Moreover, if you want to go in the ocean for fishing, kayaking or any adventure with your boat, kayak, or canoe, some rough waves can fill the floor with excess water. And that’s why you need to have a bilge pump to quickly clean out the floor or deck and if you have at least you will be able to make sure that you will safely reach on the shore. So to take out the water from bilge the manufacturers have invented different kinds of bilge pumps. But for kayaking the manual pumps should be the right pick, because it doesn’t need any battery to be operated. You can manually operate it to clean out the floor. On the other hand, the floor of the kayak won’t hold tons of water, so you don’t need an electric pump to be run out for hours. Moreover, the electric bilge pumps are expensive than manual pumps. So you can pick a manual pump at an inexpensive cost while It can take out the gallons of water in the matter of few minutes. If you search for the bilge pumps, you will be able to nearly discover hundreds or more. But I can surely say that all of the models aren’t great to perfectly take out the water from kayak’s floor. So after researching the experience of users I am presenting the five best kayak bilge pumps that properly take out the water and don’t make any leakage even after years of use. This is one of the perfect manual bilge pump that is very simple to use. You can comfortably use the rubber gripped handle of it for pushing down and pouring out the water outside your kayak. Because of the rubber grip in the handle you can comfortably keep pushing without getting hurt on the palm. Although it doesn’t feature a hose, but you can adjust a hose with the valve to pour out the water outside your kayak. To comfortably take out the water from the floor you should add such a hose that is 1 inch in internal diameter. The neon colored body of the pump is great for a proper visibility and you shouldn’t feel any inconvenience to carry it with your kayak, because it only weighs 12 ounces. Moreover, the plastic body of this pump skips the chances of losing it in the water, because it simply floats on the water. There is a reason why I like the SeaSense Pump a lot, because it is able to reach on the most compact place to take the water, as the reason you can properly clean out the bilge. Like the previous pump of this list it also comes with a rubber gripped handle that is smooth, soft and great for gripping. 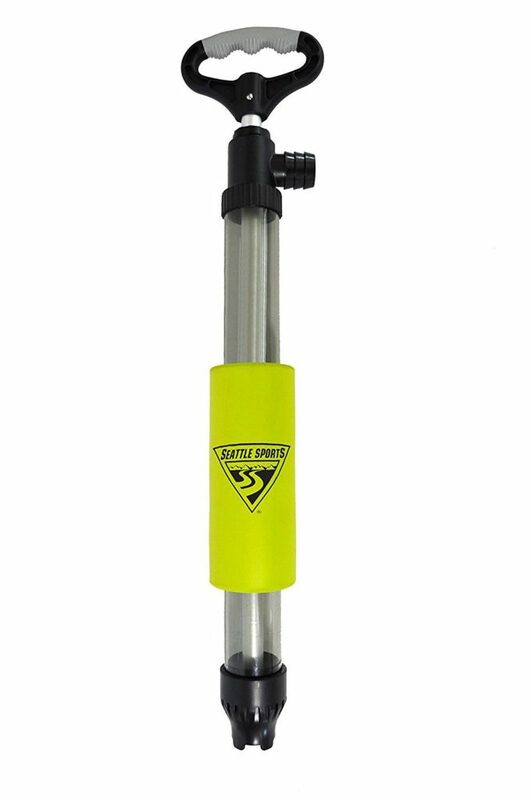 The high impact handle of the pump will ensure that it is able to create an excellent force when you hardly push it and literally you can simply keep pushing up for minutes for taking gallons of water out from your kayak. Its ergonomic design with anti leak body can provide few years of service while the corrosion resistant body keeps up its excellent service for years. You can adjust a hose for your convenience, but if you don’t, the pump is also able to push the water outside kayak for its great force. Like the other ones of these five best bilge pumps the Seattle Sports Breakaway has the extreme capability to easily clean up the kayak’s deck. What I like most on this bilge pump, its aluminum shaft that maximizes the sturdiness. Another perfect thing offers this pump, you can replace the plunger if it is unfortunately damaged. The pump can approximately take up 8 gallons water at every minute that is incredible. By adding a rubber grip with the handle it ensured the comfortability and easiness for using this pump. Even it added a lime colored foam over the body to keep the importance of visibility in mind. The Sea Eagle High Volume yet another great bilge pump to remove gallons of water at every minute from the deck. Although it looks simple, but the performance level is amazing as the leak proof body will take up the and through the water away with a great force. It features a hose for some extra convenience while the corrosion proof plastic body maximizes the pump’s lifetime. The handle of the pump fits properly with hands and that’s why pushing the handle is easy and convenient. Moreover, there is low risk of losing the pump, because it will float on the water. So never lose again your bilge pump. 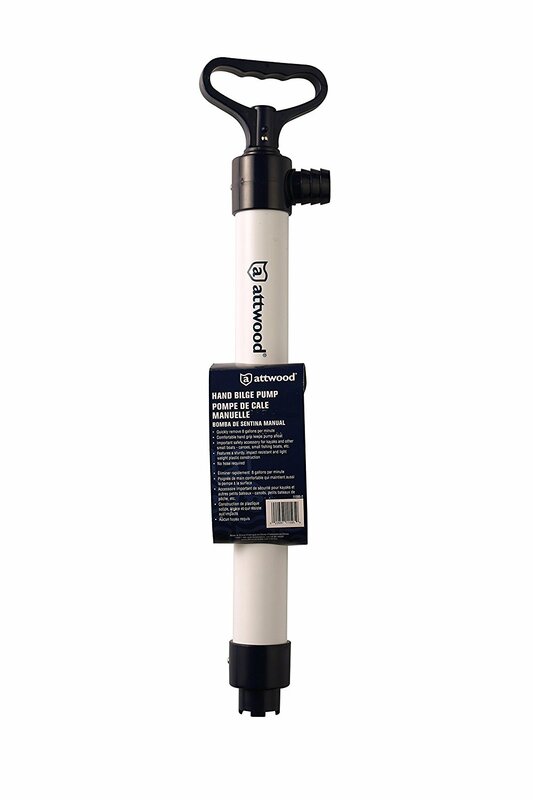 This 18” inch long Attwood Hand Bilge Pump might not make your budget expensive while it’s a great pump that can take up 8 gallons water per minute. Literally, this is one of the excellent thing that this pump can do for you. Its impact resistant feature on a sturdy and lightweight body will allow you to push the handle comfortably without letting anything go wrong. Although you don’t need a hose to use this pump, but if you are comfortable with using a hose, then you should adjust it additionally. Like the other pumps of this list it is able to float in the water, so no worries of losing when you are using it to remove the water. No matter how simple these pumps look like, they are really helpful to remove the water from kayak. Whether the kayak has been leaked by getting an impact with the rocks or the deck is filled with necessary waters by the rains or waves, when you have a bilge pump you can remove these waters in the matter of few minutes. So get such a handy bilge pump without breaking the bank and enjoy the kayaking with pure confidence.